Calcalist will host a two-day tech and innovation conference in Berlin on February 18-19. As part of the event, WeTechBerlin, Calcalist is leading a delegation of some 50 startup companies that will participate in B2B meetings with investors and German companies. More information about the conference can be found here . 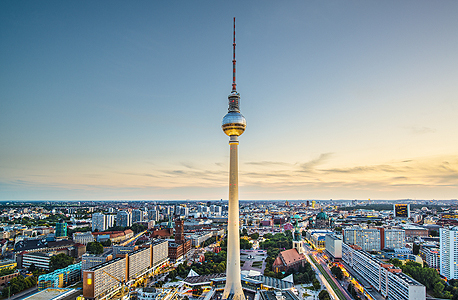 The conference, which will be held at the Hilton Berlin, will bring together tech executives and industry leaders from both Israel and Germany. Retail analytics startup ciValue offers customer analytics, data monetization, and advisory services to customers which include makeup retailer Sephora, Israeli drugstore chain Super-Pharm, and Pandora Jewelry. The company develops software and mobile app that uses algorithms to personalize weight loss plans and track clients’ progress. Qmarkets develops an innovation management platform for businesses. TriEye develops shortwave infrared (SWIR) imaging technology designed to assist autonomous vehicles “see” better under limited visibility conditions such as darkness, rain, fog, and dust. Way2Vat develops a cloud-based platform that manages automated foreign tax reclaims. The company’s application enables business travelers to scan invoices and receipts with their smartphones an automatically report expenses for reimbursement. Ubimo develops location intelligence technology to enable hyper-local ad targeting and campaign planning. Legally registered as Workey Employees Recruitments Ltd., Gloat offers an anonymous career development platform. The artificial intelligence-powered platform is designed to help millennials find a career by comparing individuals' skills and career history to others and recommending potential career moves. The company develops an online real-time parking platform that provides information about convenient parking options near specified locations. Voca.ai develops voice assistants for call centers using artificial intelligence technologies. According to the company, its voice assistants are capable of analyzing speech to determine the speaker’s intention in real time, imitating human speech patterns such as changing pitch, pace, and intonation to deliver a more conversational interaction. Save a Train offers an online train travel ticket booking service. utilizing artificial intelligence algorithms to offer low-prices. Tailor Brands develops an automated design service that creates logos and advertising campaigns and let users customize aspects such as font and color. Oriient develops an indoor GPS system intended to provide real-time location services with traffic and motion analytics with an accuracy of just under one meter. Founded in 2018, AiDock develops an automated customs clearance service and general document handling technology. Bio-Nexus’ cloud-based software is used for digitizing and managing high-cost and high-risk manual procedures such as emergency treatments and aircraft fleet maintenances. Valid develops enterprise software to provide cybersecurity abilities for blockchain technologies and digital assets management.